Beautiful salad! So healthy, so rich and delicious! I don't think I can buy this particular lettuce or red currants, but I can use raspberries instead, I guess. I will definitely try a variation of this. Thank you for sharing and have a wonderful week! Fig and balsamic vinegar really goes well together , isn't it ?! Such a refreshing and healthy dish , Angie ! A delicious salad! Really refined looking. Great flavors. Fresh figs ate notoriously expensive in these parts; sometimes costing as much as $2 each! Notwithstanding, this is a lovely combo of flavours perfectly balanced. Angie, this is the most exceptional and exciting recipe! Figs are my absolute favourite but sadly our tree is standing bare at the moment. It will be another 6 months before I can enjoy a fresh fig. I love to combine fruit in my salads. It looks delicious and perfect for the heat. Don't usually think of figs in salads...why not? Great addition of sweetness! Angie, your salad is spectacular, especially the last photo. Makes we want to jump into the screen. I keep meaning to tell you how much I enjoy the clever quotes you use that are such fun to read when we leave our comments. It's a thoughtful gift from you that always leaves a smile on my face. Delicious this salad. Great the addition of balsamic vinegar. I'll happily finish this full plate rite now.Irresistible salad. I am SO excited for fig season! This salad looks marvelous. Lovely recipe Angie .... but the pictures of those figs are frameable! Gorgeous offering...This would be fabulous with serrano ham, proscuitto or viande de grisons...Thank you for inspiring my light dinner! What a stunning salad! I love all the different flavor components...and that balsamic reduction is perfect! With a fig tree bursting with fruit that will be ripe in the next couple of weeks, this is ideal for us. I think I'd like to use arugula and perhaps dried cranberries (I'm not sure I can find currants). Figs have always been one of my favourites. I can't wait to try this recipe out. Thanks for sharing! 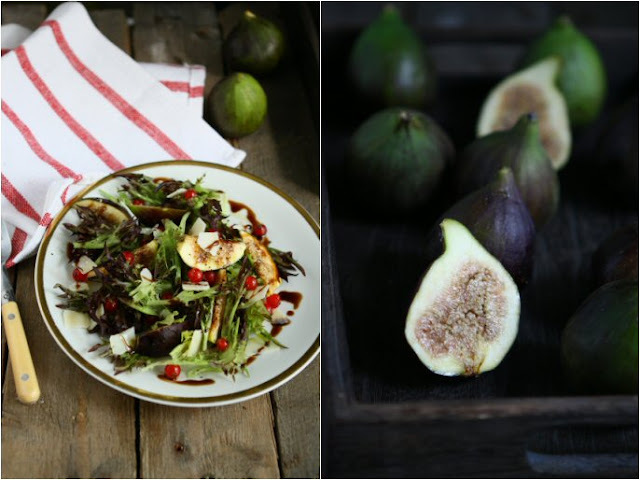 Love figs and this salad is making me hungry. I've had fresh figs so rarely, they're a special treat for me. THis would be one great way to treat myself! Figs are not yet ready here. They will be in a couple of weeks and then I will definitely try this tasty and refreshing salad! Will be making this salad as soon as my figs are ripe, did not plant Lollo rosa lettuce this year but have other varieties that will make great substitute. Absolutely divine combination...One of my weaknesses is cheese and fruit. This looks outstanding, Angie! Beautiful salad! Figs look beautiful. And the salad! I wish there was more fig sold here! Your pictures are stunning and this salad is gorgeous. I'm sure it tastes just as wonderful as I love all these ingredients and the combination must be heavenly. Angie - I love all the components in this gorgeous salad. I've never seen argan oil before - where do you buy it from? I am eating more fruits than vegetable this summer and fig is one of them! Liked the recipe. Simple and perfect for the season. I have not yet got the chance to taste fresh figs, must be really delicious huh! the dried ones are chewy and mildly sweet too, of course there's no way I can use them for salad lol! How luscious and delicious! This is a recipe I have been wanting to make for years too! I must try it soon! Fresh figs! Beautiful and delicious looking salad! If only that plate is right in front of me! 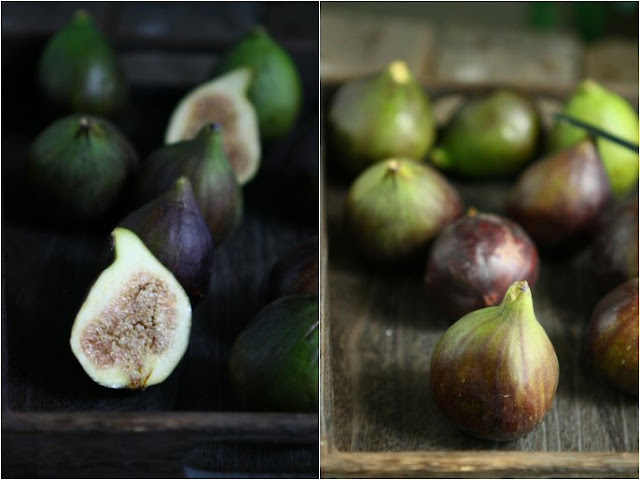 Love figs, dried or fresh, having them in such a lovely salad is definitely irresistible. Angie - you just handed me the perfect summer lunch. Thank-you! What a splendid way to use figs. Gorgeous and delicious looking salad! The figs look so gorgeous! Such a delightful salad! I got them from an online gourmet store. sounds so simple and yet looks incredible!!! Fig, parmesan and balsamic! This salad is calling my name. I love figs and this salad looks amazing,Angie! What a lovely salad. I wish fresh figs a more easily available here. I love figs. What a lovely salad... it looks wonderful! Angie, this salad looks like a piece of art work! Just beautiful and so delicious sounding! What a lovely salad and it sounds so simple! stunning! beautiful flavors and beautiful photos! Just gorgeous... the sweetness of the fig would make this salad divine. What a gorgeous salad! the sweet fig is so well paired with the parmesan. This salad is a beauty, so fresh, simple and elegant. oh that looks lovely! i love a good salad on a hot summer day! especially with figs!! What a delicious combination of flavors, I love the sweet figs with the salty cheese. You come up with such gorgeous salads! What a nice salad Angie...I never had fig in salad...and I love the look and the sound of this. Yum! I haven't had fresh figs in a while. I love anything with balsamic. I would love to try a fresh fig someday! What great flavor combos in this salad. Angie, this looks amazing! Figs and parmesan is a perfect flavor combination. I love fresh figs but I haven't seen them here yet. I should be soon, though! I'd love to try this delicious salad, Angie. I was at the grocery store this afternoon debating whether or not to buy figs--I ended up not getting them, but this recipe is making me wish that I had. Looks delicious! What a gorgeous salad! Perfect summer dish! Every time I go to the market, I pick up a basket of figs. I can't get enough of them at this time of year. And salads like this are one of my fave ways to enjoy them. Great colors and textures for this salad. And it's healthy too! Looks lovely!! I love figs and always stock up during their season!! Beautiful photos too!! Very nice explained recipe! It looks good on photos. Angie, how crazy that I just picked up a food magazine today in the store with an article on fig season! I am so excited and I will have to make your gorgeous salad! Your photography continues to amaze me! So creative! What a rustic, yet very gourmet summer salad. Love the use of the figs and currants. So beautiful. Your pics of the figs in the crate are breathtaking Angie!